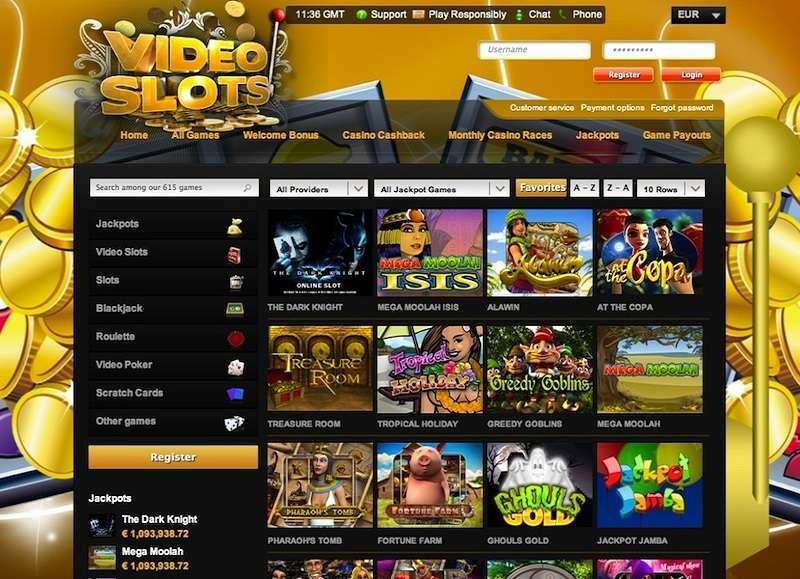 Videoslots online casino was launched in 2011 when a group of Swedish gambling enthusiasts thought that they can give a better experience to customers. With enough background in the online gambling industry, they worked with software developers and game suppliers to power the casino. Today, Videoslots is supported by more than 70 game developers from all over the world. Short time limit on bonus conditions. Restricted in a lot of countries. the MGA is not limited to issuing permits to casino operators. It also provides services and permits to lotteries, amusement machines, physical bingo halls, cruise casinos, sweepstakes, and the national lottery. All online casinos that have physical locations or headquarters in Malta must secure a licence from MGA. Curacao eGaming is an entity that issues business permits to casinos that operate within its state. But unlike UKGC and MGA, this entity offers little protection to players. So pretty much, the only thing it does is to issue a permit but not regulate the casinos. The casino offers a few bonuses, and we will explore these in this Videoslots review. Currently, players can choose from Welcome Bonus, Reload Bonus, Reward Bonus, and Free Spins. Welcome Bonus. Players who sign up will get a 100% matchup on their first deposit up to a maximum of €200. The players will also get €10 extra. The wagering requirement for the welcome bonus is 20X of the bonus, and this will expire after seven days. Reload Bonus. Upon reload, a player will get a code through email or SMS. He has to use this code to avail the bonus. The wagering requirement is 20X of the bonus, and it will expire after seven days. The casino did not stipulate any specific amount or percentage about this bonus. Reward Bonus. This is not a guaranteed bonus. Players can randomly get it. The wagering requirements also vary but the average is 20X of the bonus. There is no specific amount indicated and it will also expire after seven days. New players will get 11 free spins. This bonus is wager-free. Some key things to know about the Videoslots bonus policy are listed below. Will be deposited into the player’s account in increments of 10%. The contribution of a game to the wagering requirement depends on its RTP. You can deactivate a current bonus but all your winnings will be forfeited. The bonus will be deactivated if you place single or multiple bets over €20. If you bet more than 50% of the bonus amount, this will deactivate your bonus. All no deposit bonuses are maxed at €20 withdrawal. The casino split its games into several lobbies. These are jackpots, video slots, slots, blackjack, roulette, video poker, scratch cards, other games, Vegas, and live casino. Jackpot Games. There are 80 games available here. A player can choose by a game provider or select a specific type. Examples of categories found here are 243 Ways, 3D Games, 3 Wheel Slots, 5 Wheel Slots, 720 Ways, Branded Games, Colossal Symbols, and more. Video Slots and Slots. The casino has more than 400 selections in this area. The most popular games here that you will also find in many casinos are Starburst, Dead or Alive, and the award-winning game Jumanji. Table Games. The separate lobbies offer a total of 60 games. These games include those that are found in the live casino. A player can choose from low limit and high limit games. Scratch Cards. If you are looking for quick games, you may find this area interesting. There are 39 scratch cards to choose from. Other Games. There are 60 games here. This is the area where you can find games like Pai Gow, Keno, Pontoon 21, and Bingo. 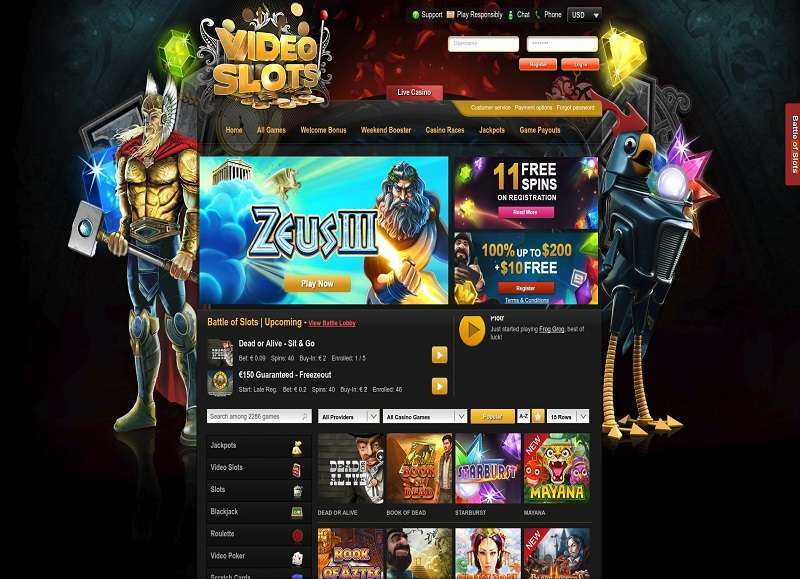 Games at Videoslots Casino require no download. The website is fully optimized for instant play. The entire website is mobile compatible. All modern smartphones and tablets may be used to play provided that they are equipped with reasonable browsers like Google Chrome, Microsoft Edge, Safari, and Firefox. The phones and tablets must also have sufficient memory speed and standard speed processors to be able to accommodate the game requirements. 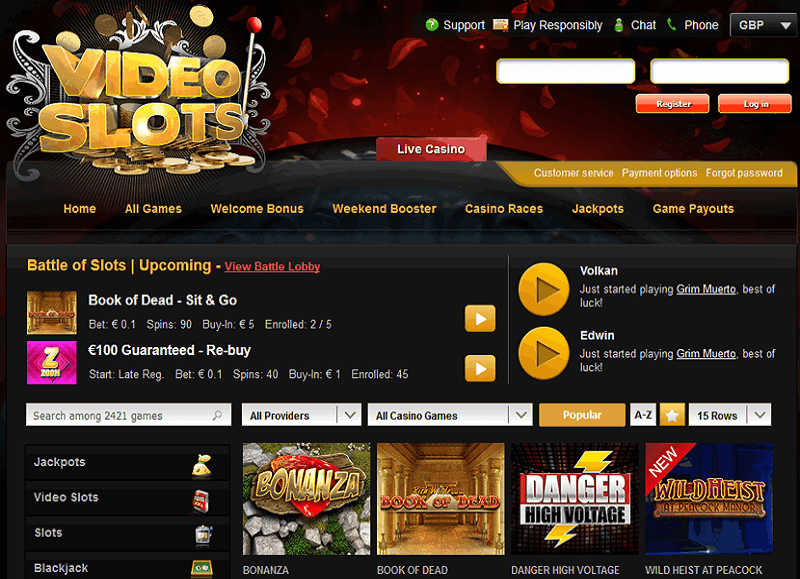 Videoslots casino offers several deposits and withdrawal options for real money. Below is a quick rundown of these institutions. Euteller – one of the leading financial institutions in Finland. Specializes in online transactions. Players must have a bank account tied to Euteller to be able to deposit funds. Trustly – a fast and secure online payment method using direct bank electronic payments. Zimpler – a mobile-based payment system that allows a player to deposit funds to online gaming facilities. SIRU Mobile – a micro-payment service that allows players to make small deposits through their mobile phones. The service is only available in Norway, Finland, and Sweden. Visa and Mastercard – provides immediate transfers to the player’s casino account. The transfers are facilitated by Wirecard. Skrill – formerly known as Moneybookers. It offers an e-Wallet service where players can deposit and withdraw funds in 30 different currencies. Neteller – one of the best and most prominent payment processors in the entertainment industry. Entropay – a good option for individuals who want a seamless transaction. EcoPayz – offers a safe and hassle-free payment system. It allows players to send, receive, and spend money worldwide. Flexipin – a private method of funding your casino account through prepaid vouchers that you can buy in more than 1,000 physical outlets. NeoSurf – a payment system where you buy a prepaid code with cash. You then use this prepaid code to make online transactions. Paysafecard – a leading payment processor in the European market. You can fund your account using your credit cards or bank accounts. Minimum withdrawal amount is £20. Players can withdraw once per day without charge. All succeeding withdrawals are subject to a €2.5 fee. Photocopy of the front and back of the credit card. Utility bill that has your name. It must match the name in your casino account. Photocopy of your ID such as driving licence or passport. e-Wallets – instant or a maximum of one hour. Credit and debit cards – will be processed within 24 hours. Bank Transfers – will be processed within 24 hours. This depends on the player’s bank. Some may take longer than this. Checks – the casino is not offering this withdrawal option for a payout at this time. There is a processing time of 24 hours for every withdrawal. This is the time that it takes for the casino to verify its own records and approve the withdrawal. This processing time does not include the actual time that the money is in transit to the bank. It also does not include the time it takes to complete the identity verification process. There are four ways by which a player can reach out to Videoslots: email, live chat, phone, and snail mail. The snail mail address is found on the website. You can view it by clicking the support link on the right section of the home page. The phone number is not listed anywhere. If you click on the phone icon, a pop-up will appear, and you need to choose your country. You also need to provide your mobile phone number, username, and your question. All these fields are mandatory, so this tells us that you must be a registered account holder to qualify for this support. The casino restricted many countries, which makes one curious since it has three licences. Here are examples: Algeria, Angola, Argentina, Asian and Australian nations and territories, Bangladesh, Belgium, Bulgaria, Congo, Cuba, Cyprus, Denmark, Egypt, France, Guyana, Hong Kong, India, Iran, Iraq, Israel, Italy, Kuwait, Lebanon, Liberia, Libya, Nigeria, North Korea, Pakistan, Panama, Poland, Portugal, Qatar, Romania, Saudi Arabia, Singapore, Spain, Sri Lanka, Sudan, Syria, Turkey, Ukraine, United Arab Emirates, United States, Venezuela, Vietnam, Zimbabwe. The main currency used in the casino is EUR. All deposits made regardless of currency will be converted to EUR. The withdrawal value will also be the equivalent of EUR in the player’s currency at the time of the withdrawal. The casino is serviced by more than 70 game developers. Players may be familiar with big names like Microgaming, NetEnt, Nyx Interactive, Thunderkick, IGT, and Play’n GO. Below are some other top-notch developers that support the casino. Konami Gaming – this is one of the biggest names in the entertainment industry that specializes in console games. It has been in business for more than 20 years. Recently, it has branched out to mobile gaming and casino software. Today, Konami is a leading innovator of slot machines. Apart from games, the company is also heavily invested in providing analytical software for operators. Realistic Games – based in the UK, this company started operating in 2002. At first, it released games through a third party machine platform but eventually created its own. It was granted a Game Host Licence in 2017, along with other leading B2B software providers. Today, it has hundreds of games in its library that range from slots, roulette, baccarat, keno, and more. Big time Gaming – this is a company based in Australia. It offers dozens of slots to a lot of casino operators globally. It is licenced by Alderney, UK, Canada, and Gibraltar. Apart from slots, the company also has a wide selection of blackjack and roulette. Fantasma Games – a company that hails out of Sweden, it focuses on gaming software compatible with mobile devices. Today, the company is putting all its efforts in the development of virtual games that will soon change the online casino landscape. The founders of the casino are keeping true to their commitment. They have created an online gaming experience that is unique. The portal can easily attract many players who are looking for a diverse range of games. With more than 70 software developers behind it, the casino provides an endless option for gamers to try. The site is designed so well and is optimized for mobile gaming. The instant play software also makes it easy for players to enjoy the game without any fuss. Its promotions are competitive. And the rules are reasonable. The operators created boundaries to ensure that players can have a great gaming experience and yet protect their interests from anyone who will try to rig or game the system. The jackpot games are impressive. 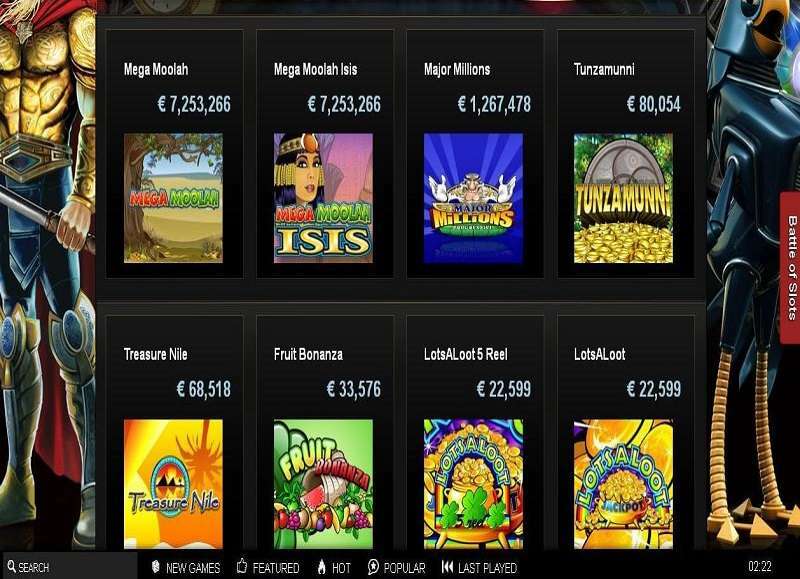 With a game like Mega Moolah, one should not be surprised to see a jackpot prize reach over €12,000,000. The customer service is also commendable. The operators have obviously taken into account the different nationalities of their patrons and have prepared how to service them. This is one of the few casinos that offer several languages for voice support.